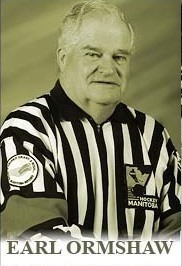 Born in Winnipeg Earl began a 40 year career in officiating in the early 60's in playground hockey and worked his way through all levels of Winnipeg minor hockey from Bantam to Juvenile. In the 1970's he officiated Intermediate hockey in the Provencher League, Pembina Valley, Interlake, South East, Assiniboine, Manitoba Eastern, University, CASH, MJHL, MMJHL, WCJHL. He attained a level six certification from Hockey Canada in 1978. Referee-in-Chief appointments in Manitoba leagues, supervisor of Allan Cup playdowns and championships in Winnipeg. Officiated 1,800 recorded games, has developed officials for major leagues and was a long time Referee-in-Chief of the Manitoba Major Junior Hockey League.